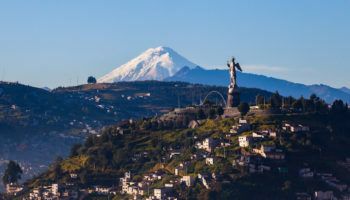 Ecuador is a land of rich cultural and historical attractions, all set within a backdrop of natural wonders, with landscapes that range between lush, tropical rainforests and glaciated volcanoes. Whether exploring the exquisite churches of the nation’s capital, Quito, or whether whitewater rafting down pristine tributaries of the great river Amazon, visitors to the nation that straddles the Earth’s equator will come away with great travel memories. 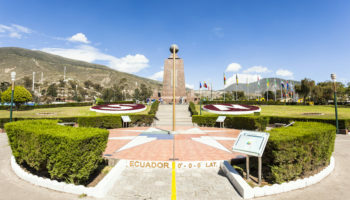 Here are the top tourist attractions in Ecuador not to be missed. Located in the heart of Quito, the Church of the Society of Jesus, or “La Iglesia de la Compañía de Jesús,” is perhaps the best known of the capital’s famed cathedrals. Built in the early 1600s, the church’s design is considered a premier example of Baroque architecture in the New World. The expansive use of gold leaf throughout the central nave of the church is breathtaking. Cotopaxi is the second highest summit in Ecuador, reaching a height of 5,897 m (19,347 ft). The volcano has one of the few equatorial glaciers in the world, which starts at the height of 5,000 meters (16,400 ft). 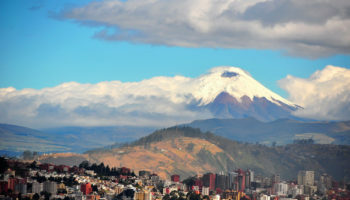 Its snow covered peak is clearly visible from Quito. Cotopaxi is also one of the highest active volcanoes in the world with more than 50 eruptions since 1738, although its present activity is limited to a few steam fumaroles. The Nariz del Diablo, or “Devil’s Nose,” describes the train line between the towns of Alausi and Sibambe. The track gets its name from the great cost of human life that it took to complete the train line. One of the most astounding engineering projects ever undertaken in the mountainous Andes, the stretch of track offers visitors sweeping panoramic views of the countryside. A series of switchbacks slowly takes the train up a steep ascent to Alausi. The Cuyabeno Wildlife Reserve, established in 1979, will appeal to travelers who want to combine the scenic beauty of tropical scenery with wildlife viewing. 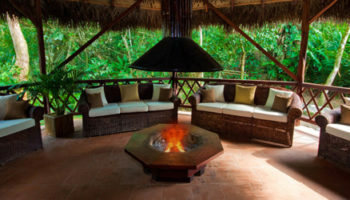 The reserve is home to more than 500 species of birds and 15 species of monkeys as well as tapirs, caimans, butterflies and anacondas, plus lots of other animals and insects. 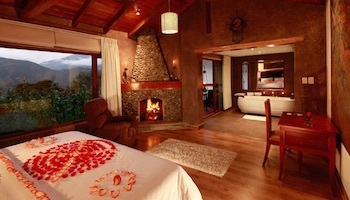 Located in the Andean foothills of Orellana Province, it is the second largest of Ecuador’s national parks and reserves. Its eight ecosystems, which include watersheds, rainforests and poorly drained areas, can be reached from Lago Agrio. Situated in the Amazon rainforest region of Ecuador, for tourists, Tena serves as a launching point for jungle adventures. Missionaries founded the town, and a cinnamon industry helped the city survive. The Tena River joins with the Masahualli River, and then with the Napo River, a tributary of the Amazon. Adventure enthusiasts cite Tena as one of the best places in the world for whitewater rafting and kayaking. 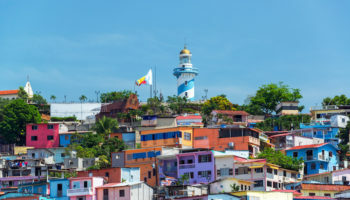 Ecuador’s southern coastal region boasts scenic shorelines and world-famous beach resorts, including the popular Montañita. Montañita Town was a sleep fishing village until the international surfing community discovered the area’s exceptional surfing conditions. Montañita is known for its nightlife as well, with nightclubs, bars and cafés to entertain locals and visitors alike. 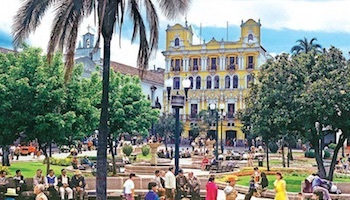 The colonial city of Cuenca is the third largest in Ecuador, popular for its year-round temperate climate. The New Cathedral of Cuenca, or “Catedral Nueva,” is the city’s most-recognizable landmark. Construction of the church began in the late 1800s and continued for nearly a century. With a façade crafted from alabaster and marble, the Catedral Nueva is most notable for the its three immense domes, each covered in blue glazed tile imported from Czechoslovakia. Part of the fun of traveling in Ecuador is exploring the handiwork crafted by local artisans, and there’s no better place to see and purchase local arts, crafts and clothing than at the markets in the small town of Otavalo. The city is known the world over for the handiwork of its indigenous people, the Otavalos. Every Saturday, in the city’s Plaza de Ponchos, a broad array of jewelry, wood and stone carvings and woven clothing are offered for sale. Located in Quito’s Old Town district, the Iglesia y Monesterio de San Francisco features several masterpieces, including a sculpture of a winged Holy Virgin by Legarda. Construction for the church began in 1550 on land where the palace of the Incan ruler Atahualpa once stood. The church complex is massive, covering nearly two blocks, and includes an adjoining museum. 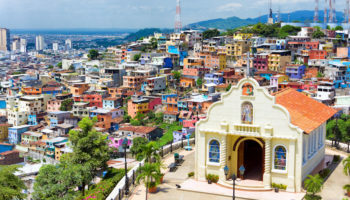 San Francisco Church and the surrounding Old Town area are considered one of the most important cultural centers in Latin America and are one of the main tourist attractions in Ecuador. The Galapagos Islands are a small archipelago of volcanic islands belonging to Ecuador in the eastern Pacific Ocean. The islands are quite remote and isolated, lying some 1000 km (620 miles) Ecuador. 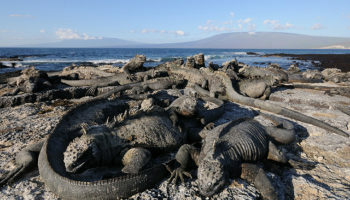 The Galápagos are world renowned for its unique ecosystem which was the inspiration for Charles Darwin’s Theory of Natural Selection. Giant tortoises, sea lions, penguins, marine iguanas and different bird species can all be seen and approached. Strict controls on tourist access are maintained in an effort to protect the natural habitats and all visitors must be accompanied by a national park-certified naturalist tour guide. Which attractions in Ecuador do you consider to be the most interesting? Again, great list of top sites, love the site! 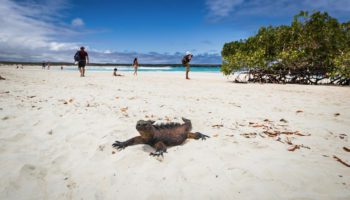 I love the Galapagos Islands! So far, it was my favourite destination in Ecuador. Ecuador’s national parks (and Galapagos is one of them) are all, as the matter of fact, worth a visit. I really liked El Cajas, for example.